This is a striking area in the constellation of Sagittarius near its more famous neighbor, Messier 8. 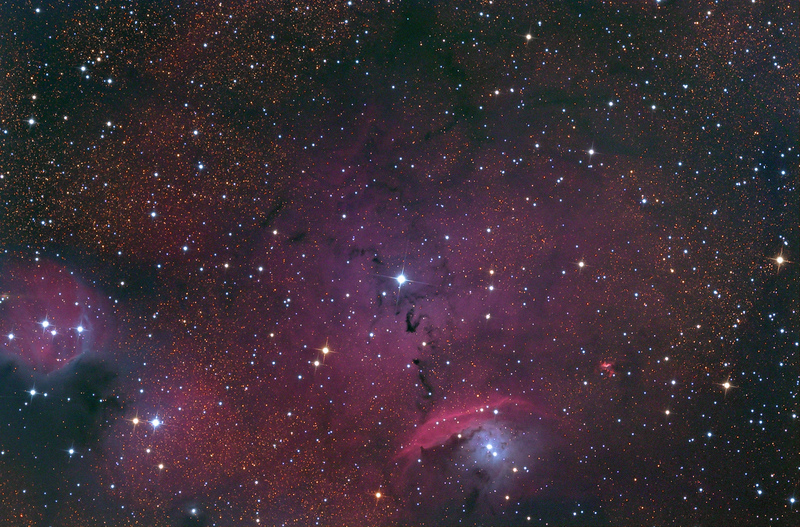 IC4685 is the nebula near the center of the image. The nebula surrounded by blue dust is IC1274 all the way to the left center of the frame. The blue glow near the bottom center of the frame is NGC6559. This is only 3 hours of exposure due to the position of this object low in the western sky. Click on the image for a better view. My colleague Leonard Mercer in Malta suggested this object after he made a beautiful image of the region. It was an excellent idea for a target. This image was taken the nights of August 30-31, 2014.